Welcome to the February 2019 issue of Black Grooves, sponsored by the Indiana University Archives of African American Music and Culture. 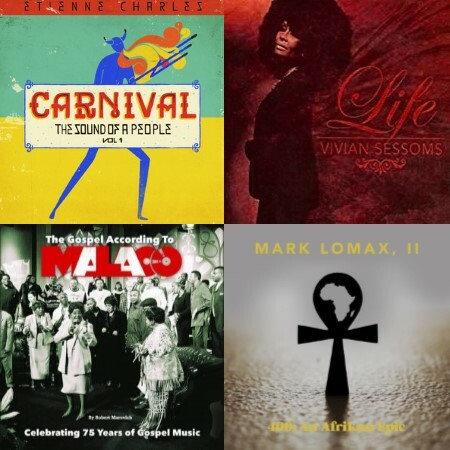 In honor of Black History Month, we’re featuring projects that explore different perspectives of Black life through music. Jazz-oriented releases include Wadada Leo Smith’s Rosa Parks: Pure Love, an oratorio commemorating the civil rights icon; Mark Lomax’s 400: An Afrikan Epic is a suite marking the 400th anniversary of the beginning of the transatlantic slave trade; Marcus Strickland Twi-Life’s People of the Sun sonically traces the African Diaspora from the past to present; Vivian Sessoms’s Life is the first of a two-part project about the Black experience in America; Etienne Charles’ Carnival: The Sound of a People Vol. 1 celebrates the music of his native Trinidad; and Chicago bassist Pennal “PJ” Johnson combines genres on Pickup Groove. Classical releases include two albums from Chicago’s Cedille Records: Rachel Barton Pine’s Blues Dialogues explores 12 works by Black composers that incorporate blues idioms; and Sisters in Song is the first collaboration between world-renowned American sopranos Alyson Cambridge and Nicole Cabell. Gospel releases include the highly anticipated box set/hardcover book Gospel According to Malaco: Celebrating 75 Years of Gospel Music, Joshua’s Troop’s new album Another Chance, and Black from Christian rapper Mr. Del. Other rap releases include Chicago poet Mykele Deville’s Maintain, and Ice Cube’s Everythangs Corrupt. Also included is the debut album Don’t Tread On We! from the black punk rock band The 1865; The Bookends from blues-rock guitar virtuoso Eric Gales; Siltane from Haitian/Creole artist Moonlight Benjamin; and Malian singer Salif Keita’s Un Autre Blanc that elevates awareness of the persecution of Africans with albinism. Wrapping up this issue is our list of January 2019 Black Music Releases of Note. Just in time for Black History Month, the folks at Time Life have produced a wonderful 3 CD deluxe box set that is a must have for every library and educator. To sweeten the deal, a companion feature length documentary will also air this month on TV ONE, and possibly PBS (more on this following the review). Sometime later this year the documentary will also be released on DVD, perhaps in an expanded version. The Let Freedom Sing box set was produced with the assistance of noted music historian Colin Escott, who has written extensively on rock, rhythm and blues, and country music, and is known as much for his meticulous research as for his writing skills. His liner notes situate each track within the historical context of the Civil Rights Movement, both within his descriptions of the music, and through the use of timelines. Though other CD sets with a similar focus have been released in the past, this compilation actually goes well beyond the Civil Rights era, including 58 seminal songs presented in mostly chronological order from 1939 through 2008 and the election of Barack Obama as the 44th President of the United States. What I most appreciate about the set is the song selection, which is at times both surprising and provocative, but always representative of the struggle for equality. The producers, which also include Mike Jason and Bas Hartong, spent two years on the compilation, and their care and attention to detail is evident in every aspect of the project. The final disc of the set picks up in 1971 with Gil Scott-Heron’s proto rap “The Revolution Will Not Be Televised” and follows with a number of popular Black Power era songs by the Chi-Lites, Marvin Gaye, the Isley Brothers, and the O’Jays, along with Aaron Neville’s “Hercules” and Bob Marley and the Wailer’s “Get Up, Stand Up.” From this point the disc segues briefly into the ’80s with the Jungle Brother’s hit “Black Is Black” and the Neville Brother’s “Sister Rosa,” while the ’90s are represented only by Chuck D’s “The Pride.” The set concludes with five recent releases, including “Unity” by Sounds of Blackness, “None of Us Are Free” by Solomon Burke, “Eyes on the Prize” by the Sojourners, “Down in Mississippi” by Mavis Staples (from her 2007 Civil Rights album We’ll Never Turn Back), and, fittingly, “Free At Last” by the Blind Boys of Alabama. (Excerpted from the press release) TV One will premiere Let Freedom Sing: How Music Inspired The Civil Rights Movement, a two-hour documentary that chronicles how the power of lyrics and songs helped move a nation during the most turbulent days of the 20th century, Sunday, Feb. 15 from 8-10 PM. The special will repeat at midnight and also air on Sunday, Feb. 22 at 1 PM (HD/all times ET). Let Freedom Sing will trace the interaction among the music, the movement and the people involved. The film showcases how the music calmed tensions when protesters were arrested and how creative pioneers in gospel, blues, R&B and pop brought music, medium and message together as never before, composing a soundtrack perfectly tuned to the tempo and pulse of its time. The film includes interviews with musicians, civil rights activists, music industry executives, historians and others involved in the movement, including former U.N. Ambassador Andrew Young; actress Ruby Dee, influential musicians Pete Seeger, Gladys Knight, Jimmy Carter and the Blind Boys of Alabama, Ruth Brown, Jerry Butler and Chuck D; and Student Nonviolent Coordinating Committee (SNCC) co-founder Dr. Bernard Lafayette. 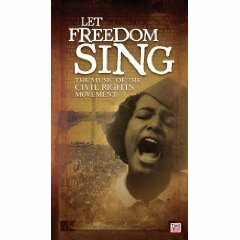 Let Freedom Sing begins in the era between the wars when segregation was often brutally enforced in Southern states, and when jazz and blues evolved from songs sung by African-Americans in church and in the fields. It will feature never-before-seen footage from the 1960s, while tracing the influence of Civil Rights-inspired music around the world and revealing the enduring impact it retains on today’s popular music. Chronicling a musical and cultural past, the film also shows how this music is living history that inextricably binds the past with the present.